Detangling is my least favorite activity during wash day. Depending on how tangled my curls are, it can take from 10-20 minutes! It is all based on how I care for my hair throughout the week. At first, I never realized how your practices could play a role in the amount of tangles your curls receive. With my fifth natural hair anniversary this month, I have finally mastered my way of preventing tangles during the week. Wash day is the only time that I will use a comb to thoroughly detangle my hair. Why curlfriend? I prefer to detangle my hair while it is wet and thoroughly covered in conditioner with slip. My favorite conditioner to detangle with is SheaMoisture Manuka Honey & Mafura Oil Intensive Hydration Conditioner, because it is very moisturizing for my curls, has great slip, and smells amazing. I prefer to detangle when my hair is in its most elastic state. When it is time to style my wet hair, I am usually able to finger detangle, but I will use my wide toothed comb when needed. During the week, I do not detangle my curls often since I fully detangled during wash day and I wear hairstyles that prevent tangling. I am selective of the hairstyles that I wear. I avoid wash and go’s, because they cause tangles for my hair. I can provide extensive moisture and master many techniques, but by day two my hair is usually tangled. I prefer to wear my hair in stretched styles, because it allows me to prevent tangles. After rinsing my conditioner, I will apply TGIN Green Tea Super Moist Leave In Conditioner, TGIN Butter Cream Daily Moisturizer as my styler, and extra virgin olive oil (EVOO). 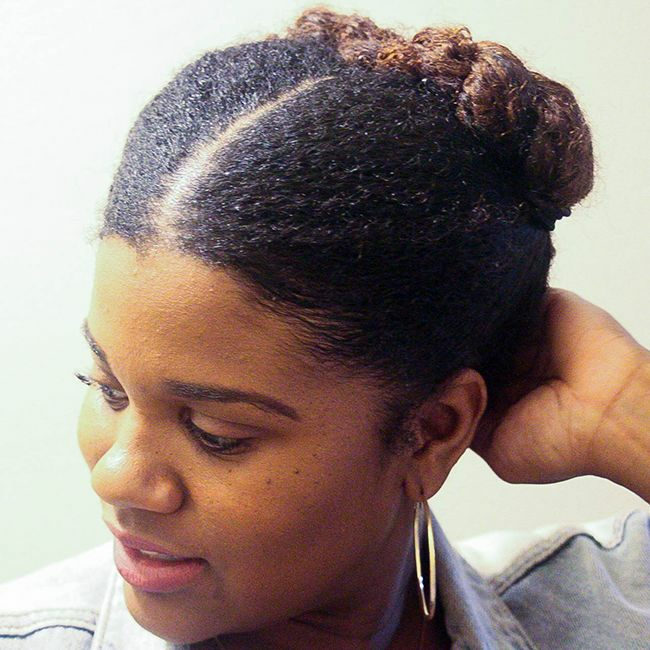 I will twist my hair in 7-8 twists and stretch the root with the banding technique and then take down my twists slowly using a little hair oil on my fingertips. To keep my twist-out stretched and long lasting, I will put my hair in pineapple ponytails at night and sleep with a satin cap. When it is time for my curls to be pinned up, I prefer to use the protective styles that I shared in my previous article. Mahogany Curls shares two protective styles that are easy, versatile, and keeps my hair tangle free. The two ponytails are in twists, which I usually keep moisturized, and the ends are tucked away. The two flat twists make me feel like I’m wearing a crown while also preventing tangles. When taking down this style, I can easily remove dead hair with my fingers. I always wear my hair in buns, but for no longer than a day or two. If I leave my hair in a bun for any longer, my hair will be in lots of tangles. How do you prevent tangles throughout the week for your curls? Please share with the curly community.